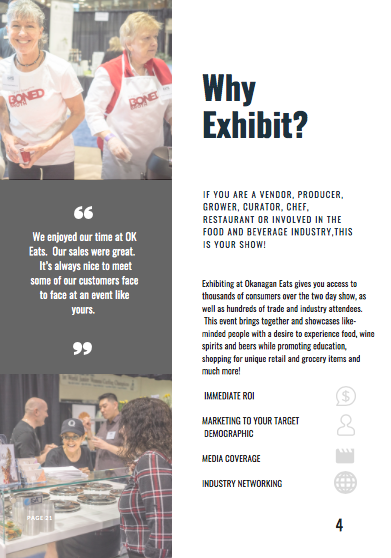 Interested in being a part of Okanagan Eats Food Show 2019? If you are a vendor, producer, grower, curator, chef, restaurant or involved in the food and beverage industry, we want to chat to you! Last year we welcomed thousands of guests to sip, nibble and shop their way through a variety of food and beverage vendors. With an exciting live stage featuring Masterchef contestants and local favourites, this year promises to be bigger and better! Our 2019 event will once again welcome vendors, guest speakers, chefs, restauranteurs, growers, producers and presenters. It will be a journey from farm to table, vine to vineyard. It will be artisanal in nature and completely gourmet. Entrants will receive food and beverage samples, as well as have the opportunity to purchase take home products from local growers, bakers, food artists and creators. It will be a buffet or rare finds and glasses filled with inspiration. From wines to fermented foods, from healthful drinks to tasty treats, your taste buds will be jumping from booth to booth, bite to bite.